SUBHEAD: Florida Orange County Public Schools are forcing students to stand during national anthem. Image above: Defiant: NFL San Francisco 49ers teammates Colin Kaepernick (r) and Eric Reid (l) kneel during national anthem last week. From (http://sacramento.cbslocal.com/2016/09/14/kayte-christensen-is-it-kaepernicks-method-or-message/). Florida’s Orange County Public Schools announced this week that their students must have parental permission if they want to kneel during the national anthem at football games. 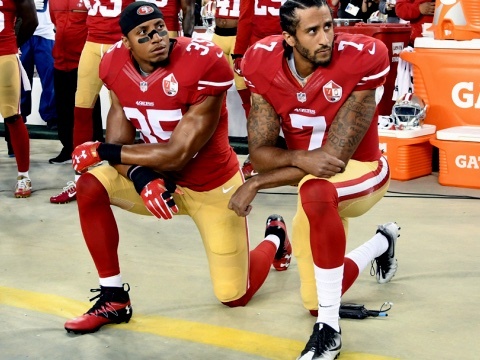 The move comes after students in at least one school district in the state reportedly knelt in solidarity with 49ers quarterback Colin Kaepernick’s protest against social injustice in America. District officials told WSBTV that they were following state law regarding the pledge of allegiance, a strict and controversial statute that requires unadulterated participation in patriotic gestures. Other school districts are punishing students who don’t follow state law. In Collier County, one principal is telling students that they’ll be sent home if they don’t stand during the anthem during sporting events, WFLA reports. Of course, such statutes fly in the face of Kaepernick’s protest (and the right to protest in general), but they’re also less lenient than in other states. [Schools] shall cause appropriate flag exercises to be held in each classroom at the beginning of the school day, and in every school at the opening of all school assemblies, at which exercises those pupils so desiring shall recite the following salute to the flag. The debate over how much freedom students have rages on in Florida. State lawmakers introducing a bill in February argued that too many disclaimers were being posted notifying students of their right to opt out of the pledge via parental permission. The bill would have put that disclaimer into student handbooks rather than conspicuous places on campus, though it would later die. Forcing students to stand at all may be unconstitutional. In fact, previous decisions in the 11th Circuit Court of Appeals have found that the portion of Florida law requiring students to “stand at attention” violated the First Amendment. Inconvenient truth is that you are ignoring the belligerent illegal military u.s. occupants here in the NEUTRAL AND SOVEREIGN COUNTRY OF THE HAWAIIAN KINGDOM.Why is that?